BA’s 111th LIR troops currently stationed at Lawa Pa, Mada Bum launched an attack on KIA’s 44th Battalion position at Gwi Htun Bum in Hpakant township on Dec 3 at around 1 pm. 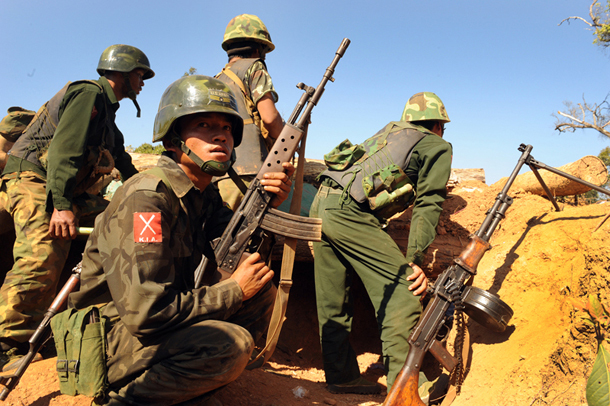 BA troops began the attack by firing 10 artillery rounds on Gwi Htun Bum followed by infantry units. The two sides battled till 4:40 pm in the afternoon. BA’s 111th LIR troops took position at a Kachin baptist church in Man Den village last week and patrolled around Ka Maing – Kawng Ra and Nam Si En area. A chinese military jet has been spotted near Ja Htu Kawng, located on China-Burma border, in KIA’s headquarters area on Dec 3 at around 8:40 am.